Discussion in 'Gadgets & Consumer Electronics Buying Advice' started by RakaKaKaka, Nov 9, 2018. I have four socket belkin surge protector and it just works. Just works means? Its not good? These cheap power strips usually have a MOV shunt resistor. You can buy these resistors in the market and make one yourself. They will clamp the voltage to whatever the rating of the MOV is (usually 2-3 times the rated voltage). Not sure if any of the manufacturers publish the data (test results) in India. They will not protect the devices from normal voltage fluctuation (e.g voltage reaching 280-300). Crazy_Eddy, tommy_vercetti and ankushv like this. Ohh. So what do you suggest getting?? I dont have time and effort to make like you suggested. Hard to say. Maybe pick one up which has insurance ( not sure what its worth, I have a few golds but never signed up). Or try picking up a used APC UPS with a predictable switchover voltage. The surge protectors are designed to protect in extreme situation, and that too only once. The MOVs become useless after one failure. Crazy_Eddy, ankushv, 6pack and 1 other person like this. just get a surge protector from reputed company like belkin/goldmedal/anchor. you'll be fine with them. tbh, for the items you mentioned, even a cheap 150~200rs from well known brands with inbuilt resistor will work fine. The surge protectors are designed to protect in extreme situation, and that too only once. The MOVs become useless after one failure. This is a key point. So is there a way to test their integrity ? Sockets feel tight so that is good. Overall it is pretty average product. Don't remember all basics like voltage resistance because i bought it two years ago. Better get surge protectors that are installed parallel to the MCB in the distribution box. You need to have a working earth connection for them. They have changeable cartridges which have indicators to show whether they are used up or still working. These are known as surge protective devices/ SPD and come in three types depending upon where they are installed in the circuit. You get Type 1 which get installed in the main breaker panel and can protect the whole house from surges generated by indirect lightning strikes. Further down the line you get Type 2 and Type 3 which get installed near appliances which you want to protect. Crazy_Eddy, blr_p, RakaKaKaka and 1 other person like this. my Logitech z906 subwoofer just got blown up while being connected to APC BX1100C-IN 1100VA two weeks back. And I have been looking for something foolproof to protect expensive home theater equipment. If you look at Amazon APC feedback, its filled with terrible reviews even for their top of the line BR1000G-IN 1 KVA model. Its the most well known brand in UPS industry but looks like the quality has gone down off lately. Im no expert so how ia something like this better than a MCB. I thought mcb also protects against low and high voltage. MCBs are for overcurrent protection. Right, more specifically they protect against short circuits within the house. A surge protector protects against surges from outside. ^the flipkart listing neglected to include an extra graphic which the amazon link had. This is critical. I thought mcb also protects against low and high voltage. MCB only monitors current. If current is excessive, then it disconnects. Its only purpose is to protect human life. You are asking about protecting appliances. MCB should not and does not. Names such as Belkin only have credibility due to myths and lies in advertising. Others who actually know this stuff regard Belkin closer to a scam. View that MX device. It says MOVs absorb surges. Does it provide a number? Of course not. Only honest recommendations include numbers. But they cannot lie in specification numbers. So how many joules does it 'absorb'? Hundreds? Probably a thousand. Surges that tiny are routinely converted by electronics into rock stable DC voltages to safely power semiconductors. Better protection is already inside appliances. Effective protectors (only recommended by the few who actually know this stuff) harmlessly dissipate hundreds of thousands of joules. rdst_1 described what is found in every facility that cannot have damage. 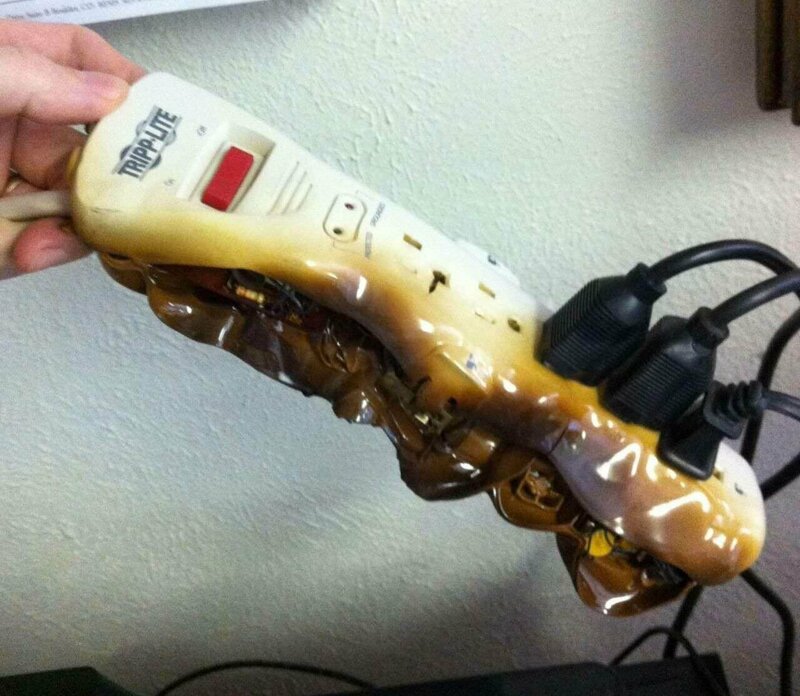 gspaul80 accurately demonstrated what plug-in protectors really do. Again that MX device. Notice a thermal fuse. That would be missing on homemade (dangerous) protectors. Since it has such tiny joules, then its thermal fuse must trip as fast as possible to disconnect those MOVs absorbing too many joules. And leaves that surge still connected to appliances. No problem. A surge that destroys protector parts is also made irrelevant by superior protection inside appliances. All this was explained in detail, with numbers, previously in https://www.techenclave.com/communi...-gadgets-surge-protector.188545/#post-2165553 . Why post same questions again? 100+ years of well proven science did not change in two weeks. Best protection on a TV cable is a hardwire from that cable to single point earth ground. (Obviously wall receptacle safety ground is not earth ground.) Best protection means no protector required. BEst protection means a hardwire alone connects that surge to earth where hundreds of thousands of joules harmlessly dissipate. AC electric cannot connect direct to earth. So a connection to earth is made by one 'whole house' protector. Then everything has protection even from direct lightning strikes - for tens of times less money. Protection that the MX devie (and equivalent products from APC, Belkin, Tripplite, Panamax, etc) do not even claim to provide. Protection necessary to protect those tiny joule plug-in protectors always - as in always - makes a low impedance (ie less than 3 meter) connection to earth. Effective protection always answers this question (as was posted previously). Where are hundreds of thousands of joules harmlessly absorbed? No protector does protection. Only a properly earthed 'whole house' protector connects a destructive surge to earth. Only then are all appliances protected. Then tiny joule plug-in protectors are less likely to create house fires. nimod, 6pack and ankushv like this.